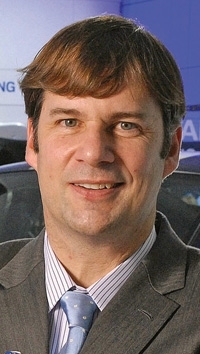 Jim Farley: “We needed time to get our dealers ready in many parts of the country." DETROIT -- Ford Motor Co. is asking Ford-brand dealers to tune up their showrooms and sales staffs for the sales launch of the 2011 Fiesta next summer. The program is voluntary and will require special commitments from participating dealerships. Those stores haven't had a vehicle as small as the subcompact Fiesta to sell in more than a decade. Ford calls the initiative the Retail Movement, following the nomenclature of its Fiesta Movement social media marketing campaign earlier this year. “We needed time to get our dealers ready in many parts of the country,” said Jim Farley, Ford group vice president of global marketing and Canada, Mexico and South America operations. In addition to the dealership training program, Ford also is launching an early reservation system for the Fiesta. It is slated to open this week. In exchange for putting in an online reservation, customers will get priority delivery, free Sync and a free premium sound system. Customers can select their dealerships or be assigned a store based on geographic proximity. • Using social media tools such as Facebook pages and Twitter accounts. • Creating an in-store “Fiesta Zone,” a special area of the showroom to display the new subcompact. • Planning specific grassroots marketing events in their communities. There may be some minimal costs associated with the training tools, said Paul Anderson, Ford's small vehicle marketing manager. But some tools can be re-used for subsequent vehicle launches. And Ford will give dealerships the chance to earn credits back for up to 80 percent of their investment if they complete such tasks. Those could include training the sales force about the Fiesta or creating a unique delivery experience for Fiesta buyers. The point is: Educate dealership employees on what small-car buyers want and how best to communicate with them. And then create an experience for those buyers that will have them buzzing about their Fiesta purchase among their friends. Ford expects many Fiesta shoppers will be 20-something urban trendsetters who typically haven't spent time in Ford showrooms. Ford already has started some of the Fiesta training that all dealerships will get. It's a striking change from the automaker's typical in-store training, which usually happens 30 to 60 days before a vehicle goes on sale.